Arterial communications between the carotid and vertebrobasilar systems in the fetus may occasionally persist in the adult. A primitive trigeminal artery is the most cephalad and common of these persistent fetal anastomoses. 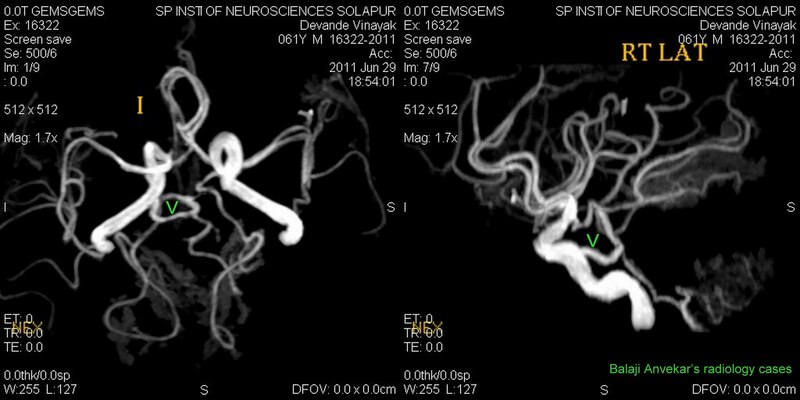 Arises from the presellar ICA extends posteriorly to join basilar artery usually between the origins of the superior and anterior inferior cerebellar arteries. The anomalous vessel usually has a parasellar course. Direction of flow in the artery is usually from the ICA to the basilar. Coexisting other intracranial vascular abnormalities in ~ 25% of patients are intracranial aneurysms, arteriovenous malformations, carotid-cavernous fistulae, and moyamoya. In this case an associated other normal anatomical variation is left side fetal PCA – left side PCA instead of arising from basilar, Pcom arising form ICA is continuing as PCA.